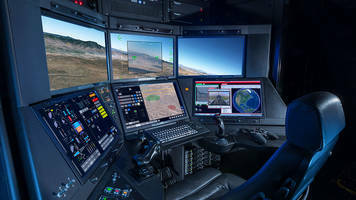 San Diego – 26 February 2019 – The U.S. Air Force’s new Block 50 Ground Control Station (GCS) – developed by General Atomics Aeronautical Systems, Inc. (GA-ASI) – for the first time controlled an MQ-9 Reaper® on January 8th from the GA-ASI Gray Butte Flight Operations Facility near Palmdale, Calif. The Block 50 GCS cockpit for Remotely Piloted Aircraft (RPA) is designed with improved capabilities through an optimized Human Machine Interface (HMI) that significantly enhances aircrew situational awareness and allows for single seat operations. It integrates multi-level security feeds with onboard sensors to display a comprehensive picture of the battlespace and incorporates improved information assurance capabilities that protect against cybersecurity risks. The design of the Block 50 provides separation of flight critical components to increase flight safety posture, enable rapid testing and integration of new mission capabilities. Hi-resolution photos of a Block 50 GCS are available to qualified media outlets from the listed GA-ASI media contact. General Atomics Aeronautical Systems, Inc. (GA-ASI), an affiliate of General Atomics, is the leading designer and manufacturer of proven, reliable Remotely Piloted Aircraft (RPA) systems, radars, and electro-optic and related mission systems, including the Predator®RPA series and the Lynx® Multi-mode Radar. With more than five million flight hours, GA-ASI provides long-endurance, mission-capable aircraft with integrated sensor and data link systems required to deliver persistent flight that enables situational awareness and rapid strike. The company also produces a variety of ground control stations and sensor control/image analysis software, offers pilot training and support services, and develops meta-material antennas. For more information, visit www.ga-asi.com.